At Teachers United, we develop great educators to become leaders for excellence in the profession and equity for students. Imagine becoming a policy expert on an issue you are passionate about and then taking a role in a campaign to leverage your policy recommendations in a way that benefits both students from low-income families and the teaching profession. Teachers decide the issues we focus on. We work together to research and develop recommendations for policy and practice, produce reports, develop campaigns and build skills. Teachers select recommendations developed by our policy teams to design campaign strategies to move our recommendations into discernible changes in policy and practice. Bringing a fresh voice to Olympia and local districts has already begun to open the eyes of decision makers and create a more rich and nuanced conversation. That's the only the beginning. Over the last three years, teachers assisted in defining high quality professional learning throughout Washington state with House Bill 1345 and informed a measure to expand preschool access within the City of Seattle. Read 2016 Intentionality Report: Closing the Revolving Door: Policy Recommendations for Supporting Early Career Teachers and Administrators. 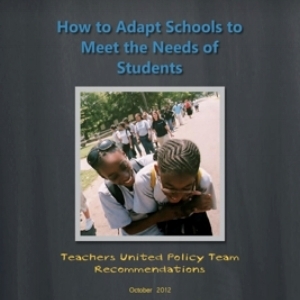 Read 2014 Intentionality Report: Strategic Preparation & Development to Retain Our Most Effective Teachers.